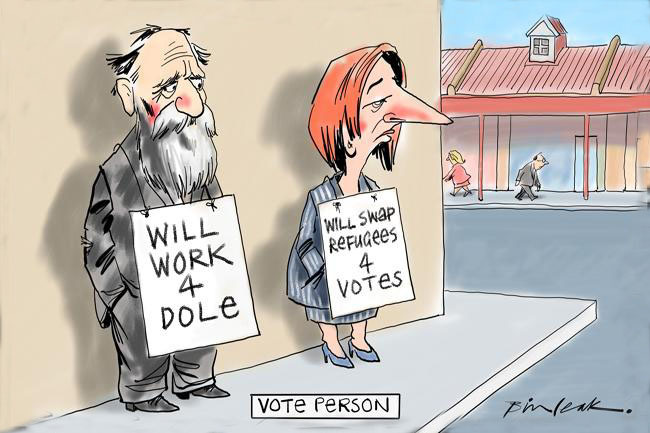 Human Rights Watch: "This election gives Australia's parties a chance to show they support basic rights for everyone. They shouldn't waste it." Just before the 2010 Election, the international human rights group wrote to all political leaders. Except for the briefest of mentions in The Age, the letter was not ever referred to by political leaders. Perhaps media outlets were too busy jealously scooping exclusives of the modern-day Punch and Judy, the Tony and Julia Circus Show. Equally concerning was what seems to be an implied message from all Australian media outlets: "We don't do human rights". We forwarded the Human Rights Watch press release and letter to 240 media outlets - but there was no response, not even from those who claim to be more open to human rights issues. We regularly send relevant documents to Human Rights Watch: we shared our government submissions about Australia's nasty people smuggling legislation, and we forwarded reports detailing the situation of asylum seekers in Indonesia with the New York HRW office. We can be proud of our work: Human Rights Watch used our sources in the letter sent to the leaders of all political parties during the election campaign. Below is the letter and Human Rights Watch's press release of August 8, 2010. (New York) - Australian political party leaders should publicly endorse reforms to meet the nation's international legal obligations to asylum seekers and migrants, Human Rights Watch said today in a letter to the party leaders. Immigration and asylum issues have been part of the national debate in the lead up to the country's federal election on August 21, 2010. Human Rights Watch expressed its ongoing concerns with Australia's treatment of asylum seekers who arrive by boat, including mandatory and indefinite detention, accommodation in remote locations away from essential services, suspension of asylum processing for certain nationalities, and exclusion from Australia's protection visa system. "People fleeing desperate situations have a right to seek asylum, and Australia should treat them fairly and respectfully," said Elaine Pearson, acting Asia director at Human Rights Watch. "This election gives Australia's parties a chance to show they support basic rights for everyone. They shouldn't waste it." The Human Rights Watch letter makes specific recommendations for ensuring that Australia complies with its obligations under international human rights and refugee law. These include rejecting proposals to process asylum seekers offshore, treating asylum seekers in Australia humanely, amending Australia's people-smuggling laws, and incorporating human rights into Australia's regional efforts to counter smuggling. The letter was sent to leaders of the Australian Labor Party, Liberal Party, National Party, Greens, Family First, and Democrats. Human Rights Watch urged party leaders to reject the Australian Labor Party and Coalition proposals to divert asylum seekers offshore to countries such as Timor-Leste (East Timor) or Nauru. Both proposals are nearly indistinguishable from the expensive and ultimately ineffectual "Pacific Solution" of the Howard years and have little basis in international law or practice. Australia's plans for offshore processing are significantly different from practices within the European Union, for example, where asylum seekers may only be returned to countries through which they actually traveled, among states that have comparable asylum standards and procedures, and that have made a commitment to provide effective protection. The debate on "human smuggling" into Australia has been colored by an over-emphasis on stopping boat arrivals and criminalizing immigration, Human Rights Watch said. Overly broad provisions in Australia's Anti-People Smuggling and Other Measures Act 2010 may permit the criminal prosecution of humanitarian acts and interfere with the ability of people to obtain asylum. The Bali Process, a regional body that Australia co-chairs with Indonesia to coordinate action against people smuggling, has taken a strictly law enforcement approach to irregular migration at the expense of human rights. Human Rights Watch urged party leaders to pledge to resolve these issues in line with international standards. As a party to the 1951 Convention Relating to the Status of Refugees and its 1967 Protocol, Australia is prohibited from returning refugees to places where their lives or freedom would be threatened. Under this treaty, Australia made a commitment to protect the physical security and human rights of refugees and asylum seekers. "Australia's preoccupation with 'stopping boats' risks cutting off asylum to those who really need protection," Pearson said. "Australia receives a comparatively small number of the world's refugees. It should be a leader in the region in protecting human rights not in devising ways to avoid its international obligations." We write ahead of the Australian federal election on August 21, 2010, to urge your party to take a position on asylum and irregular migration that complies with Australia's obligations under international human rights and refugee law. Human Rights Watch is an independent nongovernmental organization that monitors human rights in some 80 countries worldwide. We have undertaken in-depth research on asylum and immigration policy in numerous countries, including Australia. In 2005 we released a report, "By Invitation Only: Australian Asylum Policy," on the human rights impact of Australia's "Pacific Solution." Since then we have followed asylum and immigration developments in Australia closely. Recent statements by the leaders of the Australian Labor Party (ALP) and the Coalition (Liberal Party of Australia and the National Party of Australia) reveal an ongoing failure to incorporate human rights into Australia's asylum policy. Australia, like all parties to the 1951 Convention Relating to the Status of Refugees and its 1967 Protocol (the Refugee Convention), has an obligation to protect asylum seekers who arrive in its waters or on its shores. Australia has committed not to return refugees to places where their life or freedom would be threatened, to protect their physical security, and to respect their human rights. Yet, Australia's focus-at times, preoccupation-on border security, deterrence of asylum seekers from Australia's shores, and the punishment of people smugglers runs the risk of ignoring the fundamental rights of people fleeing some of the most volatile and dangerous countries in the world who are seeking Australia's protection. Prime Minister Julia Gillard has called for "a frank, open, honest national conversation on the issues of border protection and asylum seekers." In this spirit, we write to you regarding the offshore processing of asylum claims, the treatment of asylum seekers in Australia, the efforts to prevent asylum seekers from reaching Australia's shores, the new Anti-People Smuggling and Other Measures Act, and the Bali Process with a list of recommendations for change. The broad proposal by some parties to "stop the boats" and forcibly transfer asylum seekers who reach Australia to an offshore regional processing center undermines Australia's obligations under international law. From the information currently available, offshore processing in Timor-Leste or Nauru would effectively amount to a repeat of the expensive, highly criticized, and ultimately ineffectual "Pacific Solution" of the Howard era. It should be rejected as a violation of both the letter and the spirit of the Refugee Convention, and because the last attempt at a Pacific Solution caused considerable and unnecessary hardship to individuals and families. Forcible removal to an offshore processing site is highly questionable under international law. First, Timor-Leste and Nauru do not have functioning asylum processing systems and cannot guarantee refugees' effective protection. Second, the Australian-bound asylum seekers did not first pass through Timor-Leste or Nauru en route to Australia and have no other ties to those countries. Third, the transfers would be involuntary. While some governments have at times legitimately returned asylum seekers to countries of first asylum that have comparable asylum standards and procedures and through which the asylum seekers first passed en route to their final destination, this is not the case with either the ALP or Coalition proposals. Australia has little basis under international law for forcibly sending them to such third countries. Australian political parties have also not yet explained how, where, and when refugees processed offshore would be resettled. Long delays in resettlement could expose refugees, including children, to extended periods of detention, potentially violating the right of all persons to be free from arbitrary detention. Also, no plan for oversight and monitoring of conditions in detention has been put forward, despite credible allegations of abuses in Australian-funded detention centers in Indonesia (see below). Punitive treatment of asylum seekers held on Australian territory has been a feature of the current and past Australian governments. In particular, asylum claims of nationals from specific countries have been suspended, asylum seekers have been subjected to mandatory and indefinite detention, and asylum seekers have been excluded from Australia's visa application system. Each of these policies effectively imposes a penalty on refugees "on account of their illegal entry," contravening article 31 of the Refugee Convention. The April 2010 decision to suspend asylum claims only for individuals from Sri Lanka and Afghanistan was also discriminatory, and condemned citizens from these two countries to unnecessarily long periods of limbo in overcrowded detention centers or in isolated locations away from essential services, including health services and legal support. The suspension on Afghan claims remains in place, despite the ongoing war in that country. Successive Australian governments have installed punitive policies as a mechanism to deter new arrivals. However, unsurprisingly, these policies have not deterred people fleeing violence and persecution from attempting to reach Australia. Further, sacrificing the rights of one group in order to influence the behavior of others is unjust and not in keeping with Australia's spirit of fairness. Under past and current governments, Australia has adopted a range of initiatives to prevent undocumented migrants reaching Australia's shores. Gillard described the current government's approach in her Lowy address of July 6, 2010: "We move forward to an effective, sustainable, long-term solution; to stop the boats not at our shoreline but before they even leave those far away ports." However, these efforts can have serious human rights consequences and we urge you to commit to stronger safeguards in Australia's border protection policies, rather than eroding rights guaranteed under international law. For instance, the Liberal Party states that if elected it will give the Australian navy the power to tow boatloads of asylum seekers back out to sea and deny them any access to refugee screening. Such a policy and practice would violate Australia's international legal obligation to allow persons the right to seek asylum. Recall the international outcry when Thailand towed boats of asylum seekers back out to sea, and the terrible loss of life this caused. All parties should unequivocally reject maritime push-backs. Government efforts to stop boats or movements of people can have serious human rights consequences. First, measures to prevent departures, such as sanctioning carriers/airlines, pre-screening at foreign airports, visa-regimes directed at refugee-producing countries, and the provision of surveillance and military equipment and technical assistance to countries of origin and transit, are often pursued in the absence of legal channels to seek asylum for people fearing persecution in their home countries. Neither Malaysia nor Indonesia, the main transit countries en route to Australia, offer asylum to refugees. Asylum seekers in these countries are treated as irregular migrants subject to arrest and deportation. Accordingly, many asylum seekers are forced to travel by irregular means to reach the first country that can provide effective protection, such as Australia. Second, Indonesia and Malaysia both have poor human rights records with respect to their treatment of refugees and asylum seekers. The United Nations informed the US Senate Foreign Relations Committee in 2009 that refugees and asylum seekers in Malaysia "face a wide array of protection problems" and "may be subject to arrest, detention, caning, deportation and possible refoulement." With respect to Indonesia, an independent researcher who visited Australia-funded Indonesian migrant detention facilities reported in November 2009 that "detainees suffer malnutrition, depression, anxiety, skin diseases, vomiting and diarrhoea, and have been subject to violent beatings by Indonesian authorities." Media reports this June described how Indonesian detention center staff use stun guns on detainees. No apparent effort was made in Indonesia to investigate these reports of ill-treatment or bring the perpetrators to justice. Media accounts have also cited a detainee stating that Indonesian authorities prevented them from meeting with UN High Commissioner for Refugees officials and doctors. The debate on human smuggling into Australia has been colored by an over-emphasis on stopping boat arrivals and criminalizing immigration. This has resulted in a law, the Anti-People Smuggling and Other Measures Act 2010, which will almost certainly interfere with the right to seek asylum by allowing the punishment of those who act with purely humanitarian intentions. The 2000 Protocol on the Smuggling of Migrants by Land, Sea and Air, ratified by Australia, establishes an international framework for combating human smuggling "while protecting the rights of migrants." The Protocol defines the international crime of smuggling as the facilitation of the irregular movement of people which has both a connection to transnational organized crime and is undertaken for profit. The facilitation of irregular movement for purely humanitarian purposes is specifically excluded from the Protocol's human smuggling definition. The importance of this exception was demonstrated when a boat of asylum seekers from Vietnam reached Australia in 2003. Because their motivation was humanitarian, the two individuals facilitating immigration finally were not convicted of a crime. Australia, however, has departed from international consensus by including the facilitation of all irregular movement under the definition of migrant smuggling, with no requirement that a smuggler acted "for gain." Further, the new provisions on material support to human smugglers are overly broad and vague, potentially criminalizing a person who sends financial or humanitarian support to a family member or friend abroad, if that support is later used to travel to Australia. This uncertainty will likely deter family members from sending remittances and may restrict an individual's ability to seek asylum. In its effort to stop irregular migration, Australia is showing a troubling disregard for the right of individuals to seek and enjoy asylum. We urge your party to commit to amending this law to bring it into line with international standards. Australia is a co-chair of the Bali Process on People Smuggling, Trafficking in Persons and Related Transnational Crime, a regional initiative established in 2002 for building cooperation "to disrupt people smuggling and trafficking." However, the Bali Process has taken a narrow law enforcement approach to controlling irregular migration, with inadequate consideration of human rights or refugee protection. We note, for example, that none of the "specific objectives" of the process mentions human rights. Further, civil society groups have been excluded from the process. Australia should exercise its leadership as co-chair to ensure that commitments made under the Bali Process explicitly reflect the norms and standards of international human rights and refugee law. Reject proposals for an offshore regional processing center. All asylum seekers who reach Australian waters or shores or who come under the control of Australian flagged vessels should be able to apply for asylum on Australian territory under Australian law. Reject any proposal for detention of asylum seekers or refugees for longer than administratively necessary for identity, health, and security checks. Immediately lift the suspension of the processing of asylum claims for citizens of Afghanistan. Dismantle the hierarchy of status determination processes by which some asylum seekers are denied on account of their irregular entry the ability to apply for a protection visa or to have their case reviewed by a court. Incorporate human rights protections into existing border protection practices, including by ensuring that asylum seekers en route to Australia, who are in the custody or control of Australia or its agents, have a meaningful opportunity to seek protection in Australia. Cease funding migrant detention centers in other countries and ensure that all offshore detention facilities previously funded or supported by Australia are subject to independent monitoring and oversight, and that all allegations of abuses in detention are properly investigated. Ensure that efforts to control migration are transparent and proportional - both necessary and appropriate - to any demonstrable security risk and immigration-management purpose and are not based on prejudicial or xenophobic responses to migrants. Ensure that financial or technical assistance to other countries for the purpose of strengthening border control and combating people-smuggling includes assistance and training in refugee law and refugee protection. Australia should more vigorously pursue policies that improve the capacity of countries that commit to protecting asylum seekers and refugees and that are directed toward resolving the root causes of displacement in countries of origin. Amend the Anti-People Smuggling and Other Measures Act to bring it in line with international law. In particular, amend the definition of human smuggling so that it is limited only to actions taken for a financial or other material benefit and does not include actions taken for humanitarian purposes. Also, remove or clarify the Act's vague prohibition on Australian residents providing material support to human smugglers so as not to deter people living in Australia from sending remittances to help family members abroad. Make the humane treatment of migrants, the ability of asylum seekers to access asylum processing systems, and the principle of nonrefoulement core objectives of the Bali Process. Make the Bali Process more transparent and accountable by including civil society organizations. Thank you for your consideration of these important matters. We would be grateful to learn about any actions your party has taken to address them.